Republican Corey Stewart, who is running for U.S. Senate in Virginia, organized the rally in support of Immigration and Customs Enforcement, which also drew protesters Tuesday night. FAIRFAX, Va. — Signs, shouts and songs clashed Tuesday night outside the Immigration and Customs Enforcement field office in Fairfax, Virginia. 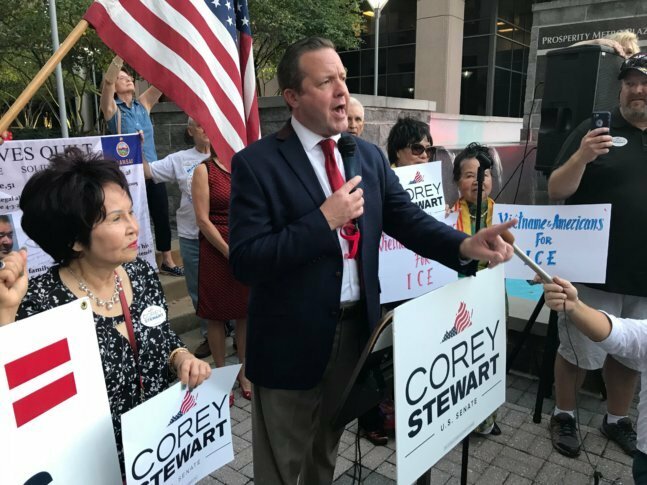 Republican Corey Stewart, who is running for U.S. Senate in Virginia, organized the rally in support of ICE, which also drew protesters. Stewart is challenging Democratic Sen. Tim Kaine in November. Stewart praised the work of ICE agents and echoed President Donald Trump’s calls for a wall along the U.S. border with Mexico. “How many lives have to be sacrificed? How many more young people have to be murdered at the hands of illegal aliens?” he said. “We should be investing in social needs rather than criminalizing people of color and immigrants,” Cendejas said.